It started with a dream. A dream where the hunter was hunted by a baying pack lusting for blood and power. And when he awoke from that dream, Lacklan Walker, ten year veteran of the SAS, knew his days of killing were not over yet. They would never be over until the pack was dead. This would be a mission like none other. Now he would answer to nobody but himself. He could have no allies, no support, no back up, because what he was going to do was nothing less than assassination. Also known as Epsilon, Omega’s No 5. Explosive violent with a high body count but is Omega finally finished? 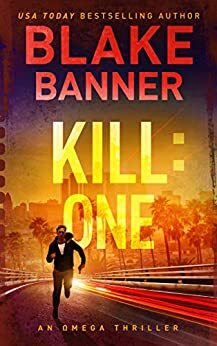 Another great read by Banner. Spoiler alert. This one starts with Lacklan in the throes of a nightmare where he is being hunted by a pack. A pack that represents Omega. As he wakes up Walker knows he's going after Omega even though he has a pact with them. You leave me alone and I will leave you alone. Walker knows eventually Omega will come for he, Abi and the kids so he decides a pre-emptive strike will be needed. Walker, Abi and the kids are living on the Walkers estate in Weston, MA. Abi and both kids love the place and Lacklan's people Rosario and Kenny love Abi and the kids and really like having Lacklan and them on the estate. Both worry about Lacklan when he's gone because they know he will be in danger. Walker tells Abi he will be gone for possibly a week, maybe two. He tells her he needs to finish Omega if he can because he knows they will be coming for him, Abi and the kids at some point. Abi doesn't like it but she understands. Walker was with the British SAS for ten years. He's been all over the world fighting and he is one very capable man. He's also a hell of a planner. A guy who knows plans save time and a plan is needed for almost everything he will be doing. Aaron Fenninger, Epsilon will be the first one Walker kills. Walker takes the Zombi which looks like sixty eight mustang but is so much more. Its an electric car and a hell of a lot more. Once in LA he parks the Zombi in long term parking till he's ready to leave and rents an old Silverado to use. He then takes a room in an out of the way Hotel. The El Toro. Its a nice hotel run by Maria who's the owner and Don the day man. Money talks and Lacklan is a billionaire so money is no object. Next on Walkers agenda is hiring a PI. The one he hires is Ted Wallace and retired police officer who runs his business. Walker hires him to watch Fennigers house and keep track of when he leaves and when he returns. Walker is a meticulous planner but he had no idea that Wallace will be murdered. So begins another damned fine read by Banner. This one has one hell of a surprise ending. An ending I hope proves to be no ending at all. This one has Lacklan, Wallace, Fenninger, a trio of Omega people who run and business that is geared to helping Omega with their plans, Captain Bob and ex Navy SEAL who works for Fenninger, a captured Walker, a Walker who is able to talk his way out of the mess he ended up in, a dead Wallace, a Walker who kills the men who killed Wallace, an estate in Malibou that Fenninger owns, a vineyard that is owned by Fennigera a group who assists Walker though Lacklan isn't really interested in this group, one of the group saves Walkers life with a fifty caliber gun, Walker tells Marni about this group and tells her to let Gibbons know, Walker doesn't like or trust Gibbons and thinks he is one who would give in to the power of Omega, Walker who plans to assault the vineyard, an assault that goes pretty much as planned, Fenningers wife and kids who are at the vineyard but a Fenninger who is not, a Walker who knows Fenninger used his family as bait, a Walker who will now be headed for Fenningers Malibou estate, a Maria who needs a hand, a Ben who is far more than Walker thinks he is and Lacklan Walker doing his best to protect his family, kill those running Omega, survive and stay alive. Blake Banner goes dark for "Kill: One," the seventh in the Omega series starring ex-SAS soldier Lacklan Walker. The novel starts with a sweet bucolic scene of Walker in his estate, sharing it with the woman he has fallen in love with and his family's two longtime employees. Perfection. But Walker worries that his time is limited. That he must end the threat to his sanctuary by Omega, a massive worldwide organization that his father once played a leading role in. Omega wants to perpetuate mankind in a gentler, softer world without starvation, climate change and geopolitical upheaval. The only rub is the secret group wants to wipe out most of the global population and get the rest to follow its directives in lockstep through mind control. So Walker decides he's got to kill the leadership, once and for all. He's got a list of the members. At least some of them, those who control North America for Omega. They're movers and shakers. Some of the most powerful people in the business world. And Walker's approach is his go-to. He gets his arsenal, drives his Mustang and stakes out his target. Basically, Banner sets him up as a straight-up murderer, a hit man. He's got his reasons. But the bad guys don't get the same kind of workup, at least at first. I'm reading this thinking, "Who's the bad guy?" Then Banner delves deeper and reminds me why I love his stories. He tosses in new information, new players. He adds details that further explain the evil of Omega and why it must be destroyed at all cost. There's an exchange with the wife of a target that's short but brutal. Walker keeps her safe but has to destroy her world. This is a very unusual book. From page one, paragraph one, sentence one Banner grabs you by the scruff of the neck and he does not let you go until he drops you, gasping and wide-eyed with his last word. In this novel he tackles the issue of mind control but, as always with Banner, he treads a fine line between fiction and actual reality. Because, this is mind control by the media: TV, Cinema, social media and the people who control the worldwide web, as we live it and breath it every day. He does not pull his punches (Banner? Please!) and he is very clear about just who the bad guys are. The book could comfortably have been twice as long, but Banner is an entertainer first and foremost, and though there is a clear message here about individual freedom and the zombie revolution, this is above all a white-knuckle ride with Lacklan Walker at his most bloody and fearsom, wry and sardonic, and at times outright funny. Lacklan is without doubt the badass hero of heros, and Blake Banner is one of the great thriller writers of our time. But bigger and longer please, Mr Banner! Lacklan, ex SAS, a highly trained individual. His arch enemy is the Omega group. Extremely wealthy and powerful individuals. They want to curtail the population growth, famine and anyone who sides against them. Their answer? They create incidents that curtail population growth. Man made disasters. Lacklan is eliminating their leadership utilizing his areas of expertise of extreme prejudice. An excellent fast moving read! Enjoyed immensely. 5.0 out of 5 starsGripping. Banner does not let you down. I find Bruce Banner to be a most engaging writer. He keeps the reader turning the pages and you just have to read the next one in the series. When the series is over, there is a definite sense of loss. So then you have to find a new series by this author. One thing that Banner does which is notable is the next book in a series picks up exactly where the last one ended. There is no repeating of events to bore you. Very, very good.